Cornelia Hediger (b. 1967) is a graduate of the Mason Gross School of the Arts, Rutgers University, with a Masters in Fine Art. Her exhibition history dates from 1999, including exhibitions in the US, Canada, France, Switzerland, Italy and Germany. Her photographs have been reproduced in publications such as PHOTO+, HotShoe Magazine, Snoecks, ARTE, and Photonews among others. Awards and accolades include a PDNs 30 in 2009, and more recently, a Silver Award in the 2016 Tokyo International Foto Awards. Cornelia Hediger lives and works in New York. 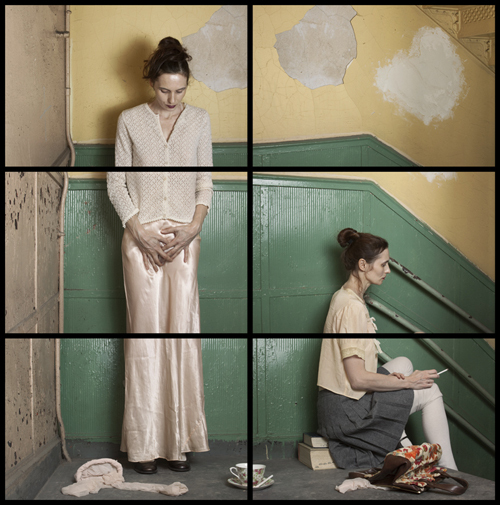 Hediger’s images are complex narratives investigating human emotions, the inner life, alter ego, and sexuality. The breakdowns of the frame into distinct sections, while related, are fractured and express the troubling of self-introspection. As Hediger explains, ”my images… explore more complex narratives, and exploring my inner conflicts, fears, and joys, therefore, became a possibility as well.” Possibility is the power, the unknown, the mystery and the ultimate attraction of Cornelia’s work. 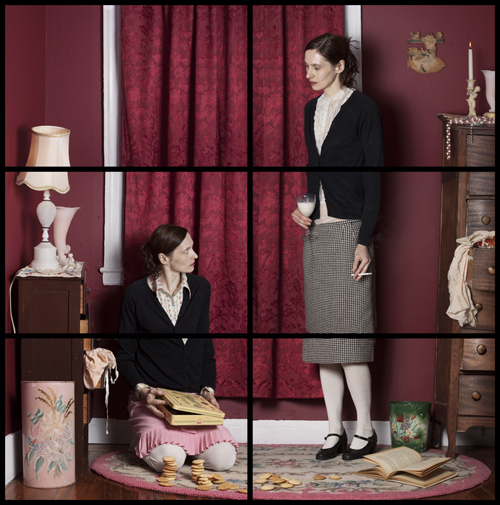 HG: Your Doppelganger series explores ideas of the self as a complex and often surprising or unknown entity. What was the impetus behind these images? CH: From the moment I picked up a camera, at university, I started to point the lens at myself. Immediately, it was clear to me that the camera was a tool to document my own emotions, my internal landscape, and my inner life. While the broad context of contemporary life has shaped me as an artist, memories originating in personal experience and family history are what influence and drive my work most of all. My fascination with stories and fairy tales go back to early childhood. It is not just a good plot that keeps me glued to a book; it is the complex human emotions within a story that holds my attention. After learning more about the Doppelgänger, especially within German literature, the subject intrigued me, and I started to think about how I could conceptualize and translate the idea into visuals. Before I started the Doppelgänger project, I was working in self-portraiture for several years. At the time I used the medium format camera, creating single-frame images. Later, I moved on to the Exit series, using a dummy to stand in as my alter ego. Eventually, I got tired of the dummy as it would not stand up and was best placed on the floor. My frustration with the dummy and my growing interest in the alter ego finally prompted the start of the Doppelgänger project. Right away I realized that I had to find a way to capture my body multiple times within one image. I did not want to rely on double exposure or any computer manipulation. Using straight photography is what I was going for, and the grid format seemed to be the answer. Photographing a set in sections not only resulted in the breakdown of the body but also hinted at a mental breakdown of sorts. I felt that my images started to explore more complex narratives, and exploring my inner conflicts, fears, and joys, therefore, became a possibility as well. Ultimately, it is my interest in inner life, the alter ego, split personality, and complex human emotions that keep my work going. HG: How has this changed as you continue to work on this series? 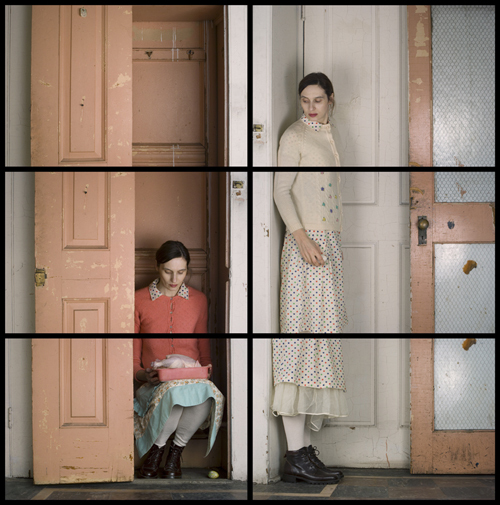 CH: The complexity of the images, within the Doppelgänger series, has evolved over time. I do not think that the images have become better, but they have become more polished. For the first two years, I was having a hard time lining things up. Many of the images I shot at the beginning never saw the day of light. They were simply too distorted. Often the gaze between the ‘characters’ completely missed, and therefore the tension and interaction between the Doppelgänger and self was not quite there. As time went on, I was able to pay less attention to the technical side of the work and therefore concentrate more on the message and the complexity of the characters. HG: Your Doppelgänger work has been compared to that of Claude Cahun, how does that sit with you? What similarities do you see and do you feel that is an accurate comparison? CH: Yes, I know, I am aware that my work has been compared to Claude Cahun’s work. I love Claude Cahun’s images very much, but I never thought of her photographs as a reference when it comes to creating my own images. I try to distance myself and clear my mind when I start conceptualizing my own images. For sure, there are similarities as Claude Cahun is working with the alter ego of Lucy Schwob or the other way around, Lucy Schwob is working with the alter ego of Claude Cahun. The alter ego and split personalities are also what I am dealing with. We are both exploring our inner life, examining identity through a number of characters; simultaneously we are both addressing our own sexuality. HG: Your Puppenhaus series has a sense of whimsy and play that is a bit at odds with Doppelgänger. Would you agree? If so, please tell me about that progression? CH: The Puppenhaus series is a natural progression that comes out of the Doppelgänger series. Both projects start off with a sketch, they are carefully planned and staged, and they are both rather timeless. Looking at a Doppelgänger images, one would be hard-pressed to say that it was shot in 2011 in NYC, for example. I have always been interested in creating my own reality. I look for and create places and environments that seem removed from specific times and places. In that sense, both projects are quite similar. There are images within the Doppelgänger series that are humorous. I do agree, however, that the Puppenhaus series is a bit more whimsical. Both projects show an array of emotions and feelings, some more light-hearted, others darker and deeper. When working, I try to tap into these emotions, and perhaps now I explore the whimsical more so than I have before. The format and the way the Puppenhaus images are constructed allow me to be more playful. Because these images are collaged together, I can take a variety of elements and visuals from my archive. This particular way of working allows me to bring together different time zones, images from my travels in Europe, baby pictures, and new work I currently shoot at the studio. I can now have a conversation with myself when I was two years old, in an environment I made up entirely. I am no longer ‘stuck’ in one place and on one focal plane, I can mix and match and tilt and distort the space more freely, and that perhaps is what makes the work more whimsical.